Space Maintainers are small appliances placed in a child’s mouth when baby teeth are lost prematurely. Their primary function is to prevent unwanted movement of the remaining baby and/or permanent teeth that occur when deciduous teeth are lost earlier than expected. A space maintainer on the lower right of a six year old from New Haven who lost one of her baby teeth approximately 5 years too early. Photos and dentistry Dr. Nicholas Calcaterra. This child lost one of her baby tooth molars on her lower right due to a large cavity and subsequent dental abscess. The offending tooth was removed by us and we placed a space maintainer. By doing so, we prevented significant orthodontic problems down the road. Deciduous teeth (most commonly called baby teeth) serve multiple functions. The obvious functions include chewing, esthetics, proper speech development, and many others. But one overlooked function is critical: baby teeth help maintain the proper space needed for the adult teeth to erupt into the proper position. Severe crowding of adult teeth when they erupt. Tilting or significant leaning of adult teeth. Decay and/or gum problems in the adult teeth. In nearly all cases, if a space maintainer is not used, significant and lengthy orthodontic treatment becomes inevitable. Are Space Maintainers Always Needed? Number of tooth/teeth missing or about to be extracted. 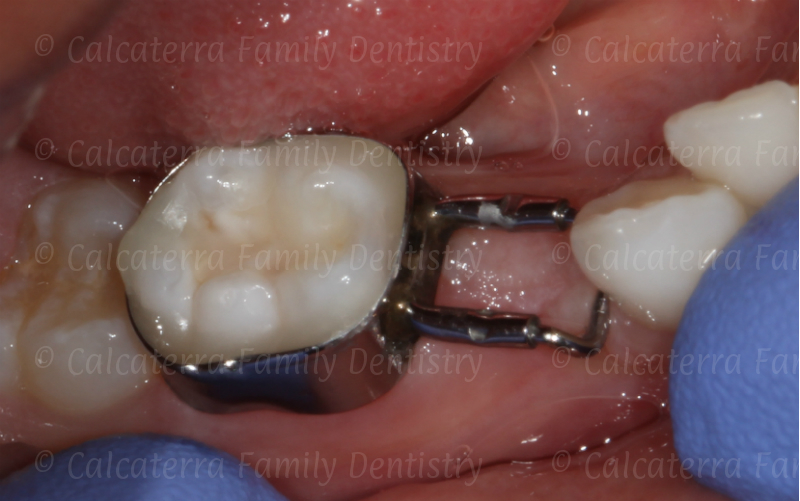 We always evaluate our pediatric patients and advise the parents if space maintainers are needed. Contact us if you would like more information or call us at (203) 799 – 2929.